Force Motors India has launched the Trax Cruiser Deluxe at Rs 8.68 lakh (ex-Maharashtra) with significant upgrades in the interiors and marginal changes on the outside. The Force Trax Cruiser is a passenger transport vehicle, commonly used in rural and semi urban areas in the Indian sub-continent. The new Trax Cruiser Deluxe gets AC vents at the front and at the centre of the passenger compartment. The other changes in the interior are the extended foot-board on the sides, two tone colour scheme on dashboard and a new instrument cluster. Changes on the outside are the new front grille, bumpers, wheel arches, headlamps, side graphics and wheel caps. The Trax Cruiser Deluxe comes with two seating options - D+9 and D+12 (D stands for driver and +9 or 12 for the number of passengers). Under the hood is a four-cylinder 2.6-litre turbo-charged DI engine producing 81PS/230Nm mated to a 5-speed transmission. It will be available at Force India's commercial vehicle dealers with a 3-year/3 lakh km (whichever arrives earlier) warranty and seven free service sessions. Ashutosh Khosla, president sales and marketing, said, "Trax is the first fully indigenous, multi utility vehicle developed in the country. Over the past three decades, it has established itself as the preferred people and goods carrier in rural and semi urban India. 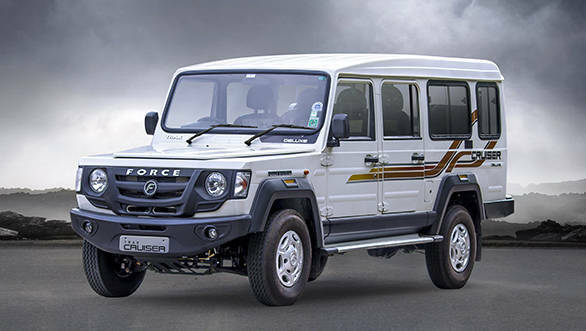 Force Motors has been constantly refining and updating it over the years thereby ensuring its unchallenged longevity. The latest variant which offers more comfort to its passengers is another step in that direction." · Superior & Powerful air conditioning makes travel more comfortable · Best in class space and comfort for long distance travel · Wider extended foot-board on sides ensure comfortable entry and exit · Two toned interiors and new instrument cluster along with a new dash board Force Motors, launched their popular people carrier Trax, in a Deluxe version. The Trax is one of the most popular and preferred passenger transport vehicles plying in rural & semi urban India. It provides the much needed connectivity from large cities to poorly connected villages and talukas. The Air-conditioned Trax Deluxe is powered by Mercedes OM616 derived, 2.6ltr, 81hp turbo-charged engine with 230Nm Torque @1800-2000rpm. The Air-conditioned Trax Deluxe is the perfect match for the passenger requirements in a tropical country like India, providing respite from extreme heat and humidity throughout the year. In order to ensure uniform cooling, AC ducts with independent compressor & control are provided in the front as well as in the center of the passenger compartment. The Trax is also the preferred passenger transport owing to its best in class space and comfort for long distance travels. The wide extended foot-board on the sides ensures comfortable entry and exit for sari clad women, children and the elderly. A new front grill, new front and rear bumpers and elegant round headlights give the vehicle an updated and refined finish. The two toned interiors and new instrument cluster along with a new dash board bring up the aesthetics to a class leading level in the Trax Deluxe. The stylish and bold coloured side graphics, wheel arches and stylish wheel caps all give the vehicle a modern look and impressive road presence. Mr. Ashutosh Khosla, President Sales and Marketing, said "Trax is the first fully indigenous, multi utility vehicle developed in the country. Over the past three decades it has established itself as the preferred people and goods carrier in rural & semi urban India. Force Motors has been constantly refining and updating it over the years thereby ensuring its unchallenged longevity. The latest variant which offers more comfort to its passengers' is another step in that direction." Trax Deluxe is available nationwide through its Commercial Vehicle Dealers network. These are fully equipped with company trained technicians, special tools and adequate stocks of reasonably priced spare parts, ensuring the Trax is in fighting fit condition, 24X7 non-stop. The new Trax Deluxe comes with unmatched 3 years / 3 Lac kms warranty with 7 free services. In Maharashtra the Trax starts from Rs. 8, 68,515 ex showroom price range.